The original version of this report contained errors in the NOTES appearing under Tables 28–30. The correct NOTES now appear in this report. The original version of this report contained errors in Table 47. The data in the “Workers with Spouse Aged 62 or older” rows have been replaced. Disability benefits were paid to just over 10.1 million people. Awards to disabled workers (960,206) accounted for over 90 percent of awards to all disabled beneficiaries (1,063,045). In December, payments to disabled beneficiaries totaled about $10.9 billion. Benefits were terminated for 728,320 disabled workers. Supplemental Security Income payments were another source of income for about one out of seven disabled beneficiaries. Workers accounted for the largest share of disabled beneficiaries (87.5 percent). Men represented under 53 percent. Average monthly benefit received was $1,134.86. Supplemental Security Income payments were another source of income for about one out of eight. Your suggestions and comments on this report are welcome and should be directed to Angela Y. Harper at 410-965-0090 or statistics@ssa.gov. Contact information is also provided on each table. 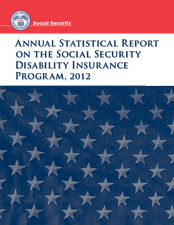 This and other reports on the Social Security and Supplemental Security Income programs are available on our website at http://www.socialsecurity.gov/policy. Data for 2001 and subsequent years presented in these tables may differ slightly from other published statistics for two reasons. First, all data for those years are based on 100 percent data files. Second, beginning in 2001, the definition of an award was changed to include secondary benefit awards, subsequent periods of disability, and conversions from one class of child's benefit to another and to exclude reinstated benefits. Those changes resulted in a slight increase in the award counts. In accordance with Public Law 111-256 (enacted October 2010), the terms “retardation” and “mental retardation” have been replaced by “intellectual disability.” This change in terminology does not affect the data presented, which are directly comparable with the data published in previous editions under the old terminology. Beginning with the 2010 edition, tables and charts showing data by diagnostic group provide detail for mental disorders in these categories: autistic disorders, developmental disorders, childhood and adolescent disorders not elsewhere classified, intellectual disability, mood disorders, organic mental disorders, schizophrenic and other psychotic disorders, and all other mental disorders. In a few instances, a table showing data by diagnostic group has been split into two companion tables to accommodate the additional detail.